One October night, when Jensen Reilly is sixteen, she and her high school sweetheart are involved in a horrible accident. Ever since then Jensen has been running from her past. But when Jensen's beloved father is diagnosed with a brain tumor, she returns to her childhood home and the memories of her old life came flooding back- as do the people she's tried to escape. 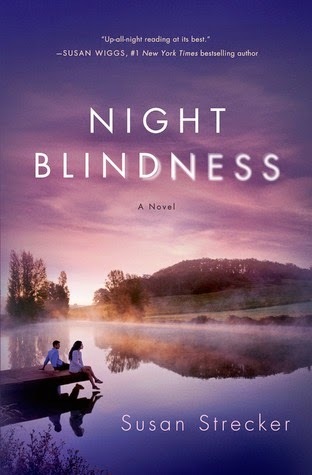 Set against the steamy background of a New England summer, filled with the intensity of first love, and framed by an unforgettable father-daughter relationship, Night Blindness is about risk and redemption, and the ways we are hunted down by what we try to escape. When I saw the title of this novel; I thought it was going to be a mystery/thriller type of story. Once I received the book and read the summary on the back cover I realized that I was wrong and I became excited; I couldn’t wait to read this book and get to know the characters. I started the book later that evening the same day I had gotten it in the mail. I read four chapters before I knew it! I immediately liked “Jensen” (main female character) I found that I had a lot in common with her and that if she was an actual person that we would’ve been friends. I found her to be brave and strong; she didn’t want people to feel sorry for her about anything, but at the same time she seemed fearful and kept things to herself instead of talking about things to someone else. I had mixed feelings about the main male character “Ryder” I didn’t know whether to be mad at him or to like him. I liked his character because he seemed like he still loved “Jensen”, but at the same time I felt mad at him for “Jensen’s” sake because of the way things had ended after their accident. By the end of the book I felt like I personally knew Jensen and her father and I felt like I had been the one to lose someone I loved instead of the character. I loved the way Ms. Strecker wrote this book; she did an amazing job from beginning to end on the way the story was laid out. I thought she did wonderfully by getting the reader hooked in the beginning on the “mystery” part of the book and keeping the reader interested throughout the entire book by alternating the narrators and past and present until the very end when the secrets were finally told. I loved that the chapters weren’t really long, I felt they were a great length. I didn’t have to dread having to read 10-20 pages just to finish the chapter. Usually when chapters are that long I tend to get tired of reading after about 5 minutes or I start counting how many pages are left of that chapter, but with Night Blindness I didn’t have to do any of that.